Because of the close cooperation with our growers, carriers and international customers, we are always up to date with developments in the international market. Short lines, efficient processing methods and an excellent infrastructure enable us to quickly respond to global demand. All that against a very competitive price. Our onion, a special story! Dacomex grows a large part of our onions in cooperation with its loyal growers. At the end of the Dutch winter, in February and March, the onions are planted or sown. 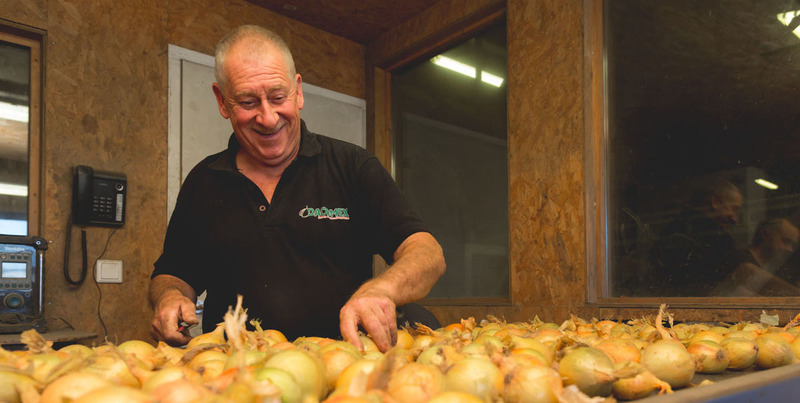 This is followed by a growing process of around 16 weeks, during which time the farmer keeps a close eye on the onions. He ensures that the onions remain healthy during this whole process. All this guarantees that the onions are of a great quality and stay good for a long time. Depending on the variety and growth conditions, they are harvested from July to September. After a few days of drying on the field, the onions are retrieved with our own trucks. The onions are instantly processed or stored for a longer period of time. High-tech storage bins ensure that we can deliver excellent quality until June of the following year. When our onion trucks arrive at Dacomex in Sint Maartensdijk, the onions are processed immediately. First, they are cleaned and soil, outer skins, tails and roots are removed. Then the onions are sorted by size. Often in 4 or 5 different sizes, depending on the wishes of the customer. When the onions are sorted by size, they are finally judged on quality. Our quality controllers ensure that only those onions that meet our quality standards are packaged according to the wishes of the customer, for instance in small 1kg bags, up to big bags of 1,250kg. Our potatoes and vegetables are processed in the same way, and can also be packaged and delivered to the requirements of the customer. After a last quality check, the packaged onions are transported with our own trucks to the ports of Rotterdam, Antwerp or Vlissingen, which are within easy reach. The onions and potatoes are loaded onto ships in cooling containers or on conventional pallets, and transported to our customers in West Africa, Central and Latin America or Asia. We have been working with the same shipping companies for years, so that we can quickly deliver to any destination in the world and can guarantee quality to the place of destination. The onions for the European market are delivered by our own trucks or trusted haulers. They know our product and know how to deliver it to the customer in perfect condition.